READ Swiss America's GOLD NEWS DAILY! Sign up now to receive GOLD NEWS DAILY, GOLD NEWS WEEKLY, or both! Register below. 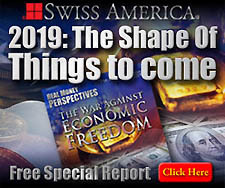 GOLD NEWS DAILY features Financial and Gold Market News, a Daily Blog, as well as Featured Commentaries by Craig R. Smith, Chairman of Swiss America. Already registered and need to Unsubscribe?